"A Knight in New York, Part 5"
A Foot Elite Guard returns to a Foot Clan HQ to rally the other Foot Soldiers, claiming that Bane's time is now at hand. 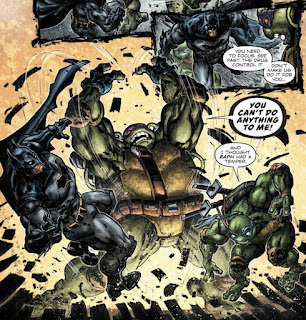 Suddenly, a Venom-enhanced Donatello comes storming in and begins to tear through all the Foot Soldiers, saying that he's been destroying their bases all across the city on his hunt for Bane. Before he can kill the Elite Guard, Batman and Leonardo leap in and try to hold him at bay, urging Donnie to calm down and fight the raging influence of the Venom. He refuses and begins to fight them. In the lair, Raphael keeps a vigil over the comatose body of Master Splinter. Robin stops by and apologizes to Raph for his harsh words earlier, telling him that he also has anger issues that he needs to work through. April, Casey and Michelangelo then call Raph to tell him that the portal is operational, but the window of time for it to keep running is slim. Raph and Robin then take Splinter through the portal and promise to return soon. At the Foot HQ, Batman tries to calm Donnie down by telling him the intel on Bane's plan. Evidently, Bane plans to add Venom to New York's water supply, hooking everyone on the highly addictive super steroid. 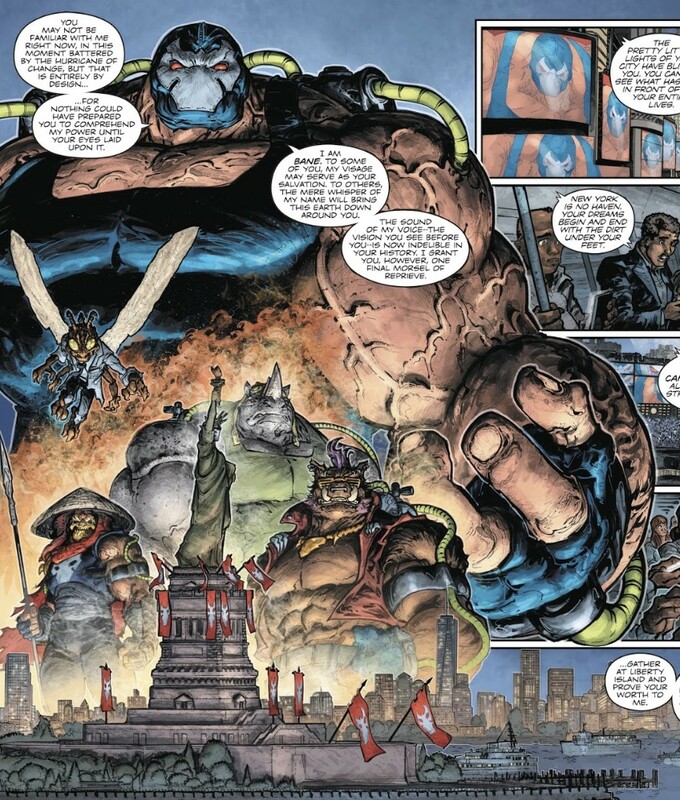 Bane will then use the population of New York as his new army to conquer outward from the city. Batman tells Donnie that they need his brains, not his firsts, to help them stop Bane. Donnie still won't listen and continues attacking. 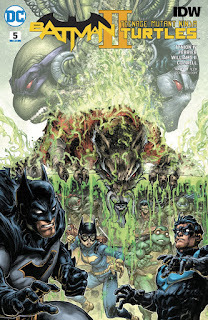 Beneath Gotham City, Batgirl and Nightwing lead Raph and Damien to a Lazarus Pit which can be used to heal Splinter. The downside is that Splinter will go temporarily insane after emerging. The other downside is that the Pit is still being guarded by Ninja Man-Bats who have begun descending on the heroes. Meanwhile, Leo decides that the best way to reach Donnie is to remind him of his intellect, so he has Batman project a hologram of Baxter Stockman's mutagen-laced Venom formula. Donnie analyzes it and immediately detects a weakness in the formula that could present an opening for an anti-toxin to flush it from the systems of the infected. Now back to his senses, Donnie agrees to go back to the lair and put his intellect to good use. On Liberty Island, Stockman hooks up some broadcasting equipment so that Bane may address the city. Back in the lair, Raph, Robin, Batgirl and Nightwing return with the healed Splinter. At the same time, Batman and Leo return with Donnie. 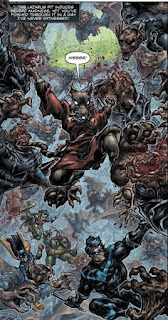 Batman is impressed that Splinter has recovered from the Pit's madness so quickly, but Splinter explains that his mastery of zen meditation allowed him to maintain control so he could help fight off the Ninja Man-Bats. Just then, Bane's address to the city appears on TV. He issues all of New York an ultimatum: To join his army willingly or be crushed. Those who want to join are instructed to gather on Liberty Island. People begin to flock to Liberty Island, where their arrival is overseen by Bebop and Rocksteady. Unfortunately, the two mutants don't notice Karai is among those coming through. And in the lair, Donnie has come up with an Anti-Venom and tests it on himself. He is immediately cured and returned to normal. Nightwing suggests that while the Anti-Venom will cure the innocents corrupted by the Venom, the Foot Clan will remain a problem, as they'll still be loyal to Bane unless someone stronger comes along. But Batman has a plan for that, and heading to Riker's Island, he springs Oroku Saki from prison. *This story is continued from Batman/TMNT II #4. 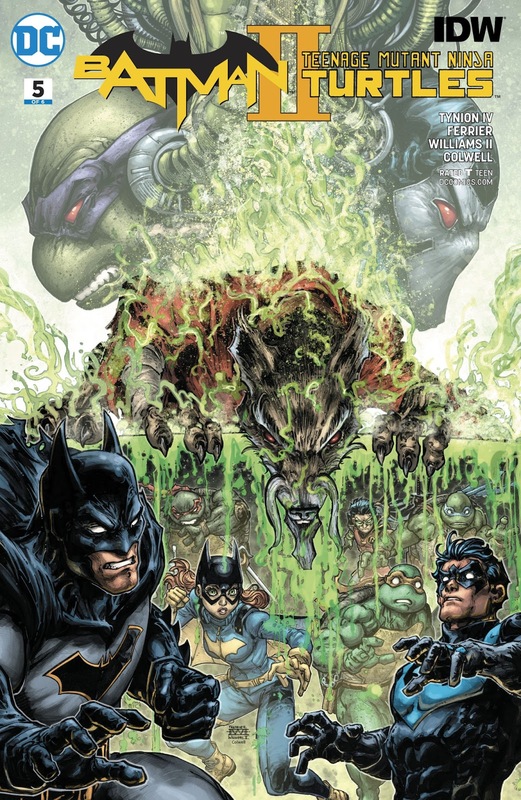 The story concludes in Batman/TMNT II #6. So back when I reviewed the second issue of this miniseries, I predicted how the storyline was going to go down. Pretty much precisely what I precognitively summarized has since happened, much of which came to pass in this penultimate issue. I'm not too proud or smug about it; I only bring it up in that the plot of this miniseries has been that blatantly telegraphed since the beginning and, one issue away from the conclusion, no curve balls have been thrown our way. I suppose an even bigger grievance I have is with how flippantly these big cliffhanger conflicts have been resolved. 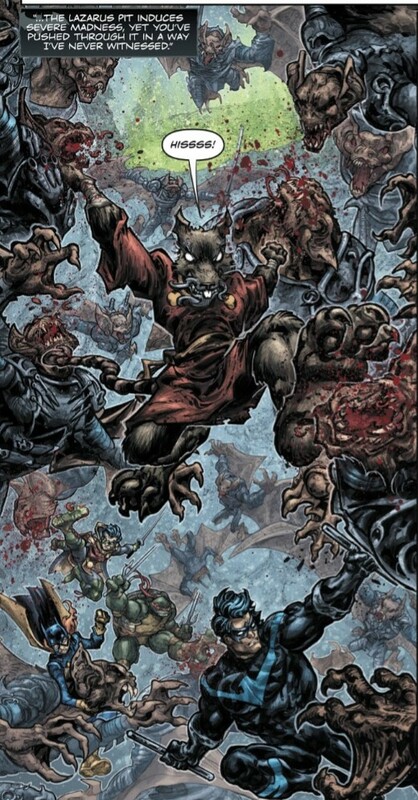 So last issue put Splinter into a coma and left us wondering if he'd pull through. This issue heals him off-panel and summarizes his recovery in a brief one-panel flashback. There was no point to Splinter's coma; he might as well have just not gotten hurt at all, for all the lack of suspense this comic treated it with. Then there's Donnie getting hooked on Venom. He put it in his veins as the stinger ending the last issue and gets it out of his system by the end of this issue. If they were going to implement this idea as a major source of tension and the means for Donnie to learn a Very Important Lesson, then it needed to last longer than an issue. Donnie should have been struggling with the Venom for a few issues, maybe even dabbling in small doses to improve his strength before going full Rage Beast. Instead, what we get is Donnie doing something very obviously stupid and then getting over it almost immediately. I've complimented the art on this mini since it started, but there needs to be a storytelling component to go with it. This has been a very sloppy, lazy script. The story beats were telegraphed in detail by the second issue and we've just been going through the motions ever since. The protagonists have to constantly make stupid, out-of-character mistakes in order to help the villain, because otherwise their evil scheme just isn't very good and would never pose a credible threat. Honestly, I'm not sure why this miniseries has been so lousy. It's made by all the same people who did the first one and that one was great! I guess they just didn't have enough creative juice for an encore. Honestly, the only thing I didn't see coming was Shredder coming back. I mean, I figured he would be back in a third miniseries or something, but not this soon. I had thought Karai would be the one to solve the problem this time around. "Honestly, I'm not sure why this miniseries has been so lousy. It's made by all the same people who did the first one and that one was great! I guess they just didn't have enough creative juice for an encore." Perhaps since now Tynion has been writing the biweekly Detective Comics for almost two years, he is a bit overworked.